I have over 25 years of experience in commercial and fine art printing of black & white and colour negatives. My personal art practice utilizes a large format 5×7” film camera to make high quality darkroom prints. Many of my black & white photographs are in the collections of State Libraries across Australia. Since 2009 I have specialised in using Epson large format inkjet printers to create fine art prints on a wide range of media for artists, designers and students. I utilize the full breadth of my experience as a large format film photographer and fine print creator to assess and control the quality of prints I now make using the inkjet printer. Your digital photographs can be printed on a wide range of fine art papers to all sizes up to A0 and larger. I work with you to assess your images on my colour corrected monitor, making adjustments to tone and colour balance where necessary. I also remove obvious spots and check cropping with you prior to printing. 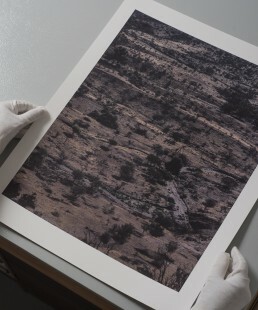 Every print is carefully assessed for colour accuracy and full tonal reproduction. I see these consultations as an integral part of the digital printing work flow, not an add-on that is charged for. Details and prices for my printing services can be found on the pricelist. Ian Hill Fine Art Printing is an inkjet (giclee) digital printing service based in Malmsbury in the Macedon Ranges & Central Goldfields region of Victoria, with postal delivery to all areas of Australia. The printing service operates from my home studio and is available by appointment Mon–Fri from 9am-5pm. Melbourne customers looking for high quality fine art prints and a lovely day out, should make the 1 & 1/4hr off-peak drive from the inner city up the Calder Freeway to Malmsbury. We have many scenic highlights in the region as well as great food destinations. If you are planning a day out, please contact me for some local knowledge and to make a time to discuss your print needs. © Ian Hill Photography 2017. All rights reserved.